Active Community Enterprise (ACE) who recently made the headlines with the ‘Battle over Lloyds Bar’ is launching their brand new ‘Amazing Mondays’. AM Offers people with learning disabilities across Merseyside the chance to get fitter. Research shows that people with learning disabilities are far less likely to exercise or eat healthily than non-disabled people. In fact only 20% of people with LD exercise on a regular basis. 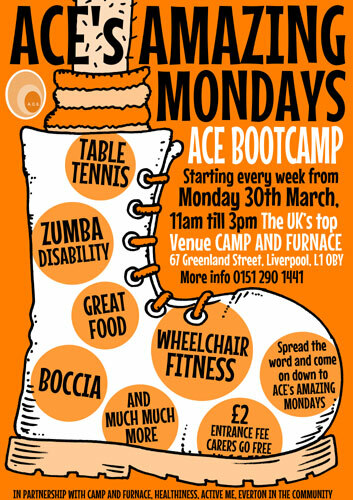 ACE are hoping the launch of their new project will get hundreds moving to the beat With Zumba, Boccia and lots of other fun energetic activities. On the same day ACE will also launch their inspiring disability film season, (also at camp and furnace). With some classic films such as ‘Temple Grandin’, ‘Mission to Lars’, ‘Inside I’m dancing’, and many many more. There will also be plenty of opportunity for learning and discussion and for people to mix and catch up with old friends and make new friends. ACE was established in 2009 by Steve Percival and Steve and Laurenna Reed, former support workers who wanted to offer more excitement and choice to people with learning difficulties. ACE offers quality-training, qualifications, voluntary and paid employment to its clients, as well as a chance to develop friendships. This improves people’s lives, their feelings of self-worth and social status, enabling ACE and its clients to give back to the community. This entry was posted on Friday, March 27th, 2015 at 10:24 am	and is filed under Events, News. You can follow any responses to this entry through the RSS 2.0 feed. Both comments and pings are currently closed.